Remove your print minimum and have your design printed regardless of how many products you sell. Removing your print minimum makes it possible to launch a campaign on Bonfire and have your design printed regardless of how many products you sell. After your first successful batch ends, your minimum will be automatically removed if your selling prices are high enough. If your selling prices are too low, you can adjust or reset them in your dashboard, manually removing your minimum. How do I unlock the ability to remove my campaign’s print minimum? It’s easy. Run a successful campaign on Bonfire and all subsequent batches can have their print minimums removed. With no print minimum, your design is always guaranteed to print as long as you sell at least one product. Where can I remove my campaign’s print minimum? Otherwise, you can click the “Remove Minimum” button after selecting a campaign in your dashboard. 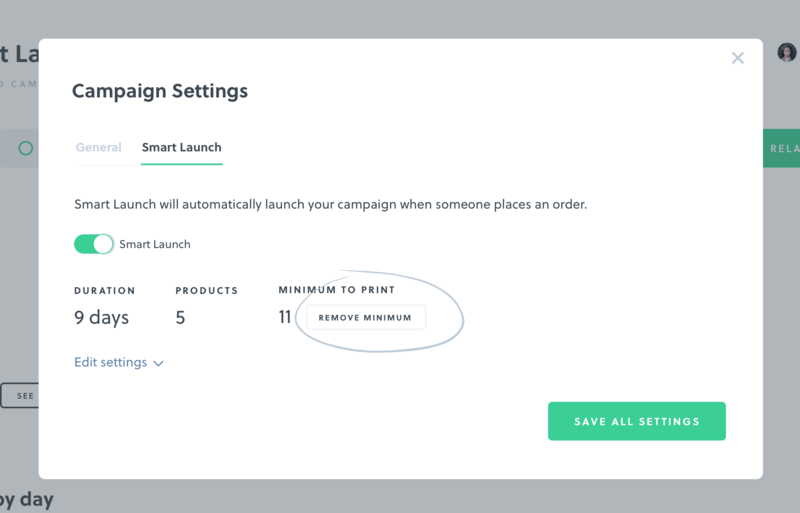 If you want to manually relaunch, you can remove your print minimum by clicking the “Remove Minimum” button in your relaunch settings. Does removing my print minimum affect when my buyers will receive their orders? Not at all! Your buyers in the United States will still receive their orders 7 to 14 business days after your campaign ends. The same goes for international orders, though they make take up to 21 business days to arrive. Please don’t hesitate to reach out to our customer success team should you have any questions. We’re always happy to help! Also, you can check out additional Help Center articles for more information.